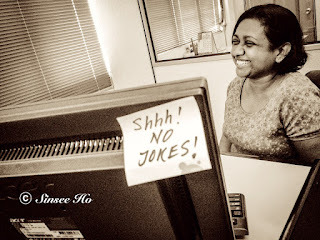 Some people believe joking at the work place is no good. The office is a working place, not a playground. But Chris Robert, the Assistant Professor of Management at the University of Missouri-Columbia’s Robert J. Trulaske Sr. College of Business whose findings have been published as a chapter in an edition of the journal in Personnel and Human Resources Management, disagreed. He said joking around on the job can actually have a positive effect on productivity and employee retention. Personally, I don’t enjoy working with people that wear a serious face. When you try to make a small joke, they simply do not get amused. Rather, you may get that look that makes you guilty of what you had just said. If you have a superior like that in a work place, I bet you do not enjoy spending time more than it should be. However, if a work place consists of managers that encourage light humor and fun poking of one another, the whole atmosphere can change dramatically. And I bet people do not mind hanging around in the office a while longer. Does humor has an impact on the work productivity? I have to agree on what he said. From experience, we connect better with people that do not take themselves too seriously and that usually has a positive effect on the emotions that result in improved performance. However, not all humor is good. Anything that is sexist, racist, ageist and crude are not only unsuitable in a work place environment, it may lead to sexual harassment charges, lawsuits or termination. So, joke all you can but watch your boundaries. Sometimes the best humor is not on poking fun of your peers but you can lighten up the whole place by sharing a funny story, picture or a saying that you heard or seen.